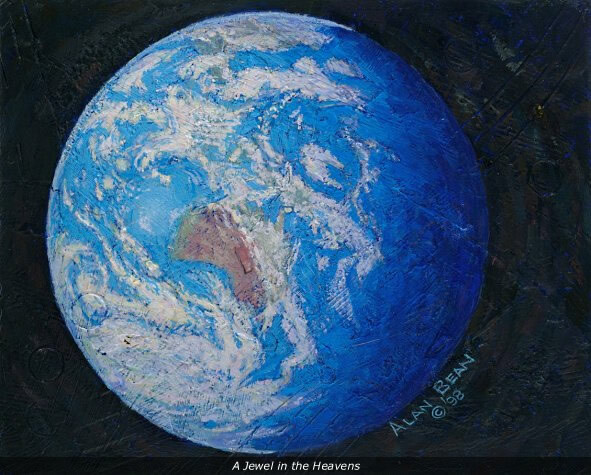 Over the years since I changed my profession from NASA astronaut to space artist, I have created several paintings of the Earth. I enjoyed doing so because it brought back vivid memories of the always amazing sight of our unique blue and white planet floating in the shiney blackness of space. Our Earth was by far the most beautiful object I saw during my Apollo 12 mission, in November of 1969. The 10-day mission was filled with so many incredible treats for the eyes, views that I had thought about for many years and at last was experiencing, first hand. Not a singe image was a disappointment. Each view out our small spacecraft windows and the vast panoramas I saw through my gold visor as I stood and moved about on the Moon was grander and more memorable than i was able to imagine. Perhaps that is why humans have a need to explore... To enlarge what we can imagine. I liked my Earth planetscapes as I painted each and thought they accurately replicated what I saw with my own astronaut eyes. With the passing of the 37 years since the Apollo 12 mission, my astronaut-eyes have gradually been replaced with artist-eyes. I now see the Earth in my mind's eye as much brighter than recorded by our camera and film. As a result of this time passing and the changes in thinking and feeling, I paint the Earth more boldly colorful now... More like a bright and incomparable jewel in the heavens. And just think Ã we get to live our whole lives on that beauty!